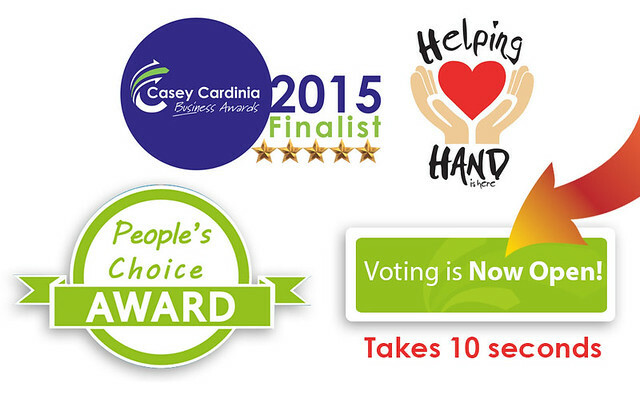 Helping Hand Is Here is nominated for People’s Choice Award at Casey Cardinia Business Awards 2015. The People’s Choice award is part of the Casey Cardinia Business Awards but unlike the other category awards, the people choice is not judged but decided by popular vote by ‘you’ the public! You have the opportunity to vote for Helping Hand Is Here! So, if you appreciate or are inspired by the great work Helping Hand Is Here is undertaking, we encourage you to cast your vote today! Voting closes 5:00pm AEST on Friday 11 September 2015. Vote Now! It takes 10 seconds!